I biked nearly 250 miles through the desert. It was hot. But even more taxing than the triple digit temperature was the long, straight road with no major markers of progress. It was a yellow strip flanked with desert shrubs and eventually a few cacti. Yes, the first 50 miles I found these spikey succulents quite novel and snapped up a number of pictures. But soon my mind needed more. I engaged it by counting out my revolutions. It was almost a military cadence count, becoming my beat of progress. 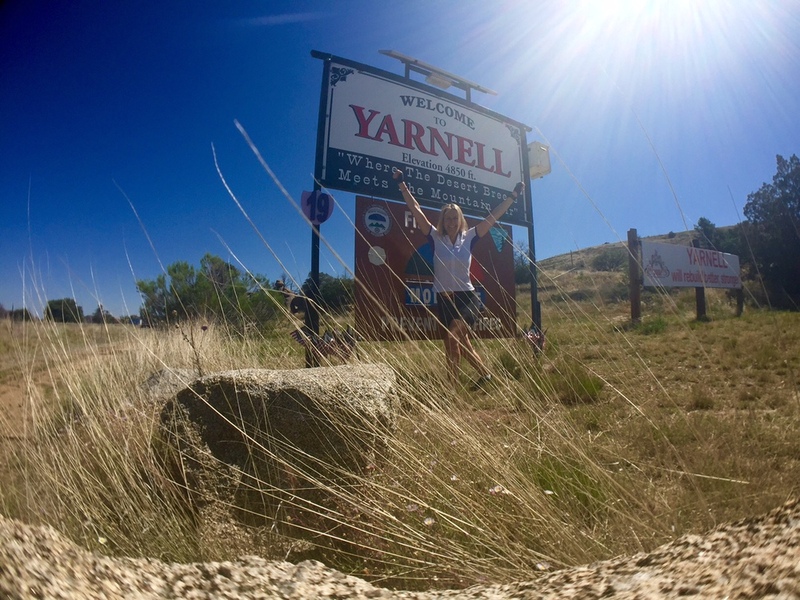 However, it was the ride from Congress, AZ to Prescott, AZ that the scenery changed and I got my much needed dose of Vitamin G.
As I started the ascent up Yarnell pass in AZ, I gained 4,600 feet in elevation. This means I rose from the desert floor to the high desert. As I snaked up the mountain, I watched shrubs grow up into trees. It was an unparalleled sense of beauty – the scope of a towering forest. I couldn’t stop smiling. I felt a euphoric high, stoking my fire within. On this day, I received my fill of Vitamin Green. Green has a stress-reducing effect on the brain and boosts energy. Being outdoors, you absorb sunlight, which stimulates the production of Vitamin D, protecting you against cancer, depression and osteoporosis. Nearsightedness can be partly counteracted by being in nature. This is because your eyes roam when outside, creating more variations of looking close up and far away. Even five minutes of exercise outside improves our mood and strengthens our self-worth. You feel connected and a part of something great. The average American child spends as few as 30 minutes in nature. Children spend more than seven hours each day in front of an electronic screen. And I know adults are right up there too. I was one of them. The impact is childhood obesity has more than doubled over the last 20 years and the U.S. has become the largest consumer of ADHD medications in the world. Disconnect to reconnect. Get outside. We know it, and I’m sure you all have felt it. After a day of playing outdoors, you hit the sack feeling fulfilled. You just feel good. Over the next two months, get outside with me. If that means moving an office meeting to a walking meeting, make it happen. If that is getting out of the gym and running in a park, make it happen. If that is turning off the TV and taking your kids on a nature hike, make it happen. If that is putting your cell phone down and looking up, make it happen. Just get out there. You know the story. Once you get your first dose of Vitamin G, you just want more. Time to overdose on nature.